A pioneer in the chemistry of protists, Seymour H. Hunter (1911-2003) was among the founders of the Haskins Laboratories in 1935, helping to establish its programs in microbiology, genetics, and nutrition (now affiliated with Pace University). His diverse research interests centered on protist nutrition, and he is credited with significant advances in understanding the ecology of marine plankton and the development of culturing methods for algae and protists. Stemming from his work on nutrition in Euglena, he developed microbiological assays for the determination of vitamin B12 in human tissues, and other research was foundational for understanding of the role of chelation for metals in culture systems and clinical use. Sometimes called a “protozoology missionary,” Hutner was a founding member of the Society of Protozoologists And was noted for his ability to recruit and inspire students and colleagues. The Hutner Papers contain a significant run of scientific correspondence concentrated in the 1970s and 1980s, relating to Hutner’s research, publications, and the Haskins Lab, along with a small amount of material relating to his position at Pace University and some personal correspondence. John Kloetzel began his academic career in 1967 with his Johns Hopkins dissertation on the fine structure of the larval salivary gland in a dipteran. After a postdoctoral fellowship at the University of Colorado, however, he began publishing on the structure of the ciliate cytoskeleton, working on Euplotes for much of his nearly forty year career at the University of Maryland Baltimore County. A past president of the International Society of Protistologists, Kloetzel has retired to Oregon. The bulk of the Kloetzel Papers consists of TEM and SEM micrographs of protists, along with some correspondence, grant proposals, and manuscripts. Other Kloetzel material is located in the records of the International Society of Protistologists at the University of Maryland Baltimore County Library. A specialist in the cryptophycaea, Paul Kugrens was born in Latvia in 1942 and lived in Pegnitz, Germany, until he emigrated to the United States with his parents at the age of eight. After receiving bachelors and masters degrees in zoology at the University of Nebraska and a doctorate at Berkeley (1971), Kugrens joined the faculty at Colorado State, remaining there for thirty-seven years. His research centered on the cell biology and ultrastructure of the cryptophytes Chroomonas, Cryptomonas, and Rhodomonas, and microalgae such as Prymnesium and Cyanophora. The Kugrens papers include extensive documentation of the research and professional activities of a phycologist, including correspondence, grants proposals, manuscripts, and field data, along with thousands of electronic micrographs. The experimental ciliatologist David L. Nanney spent much of his career studying the protozoan Tetrahymena. Under Tracy M. Sonneborn at Indiana University, he completed a dissertation in 1951 on the mating habits of Paramecium, but soon after joining the faculty at the University of Michigan, he turned his attention to Tetrahymena. 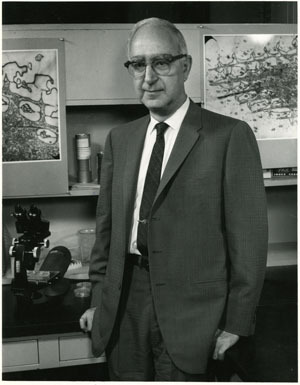 During his subsequent career in Ann Arbor (1951-1959) and at the University of Illinois (1959-1991), Nanney made a series of fundamental contributions to the cytology, genetics, developmental biology, and evolution of ciliates, influencing the work of other biologists such as Joe Frankel, Janina Kaczanowska, Linda Hufnagel, and Nicola Ricci. Since his retirement in 1991, Nanney has remained in Urbana. The Nanney Papers include a dense run of professional correspondence with ciliatologists, geneticists, students and colleagues regarding his pioneering research on ciliates and other professional matters. Of particular note is an extensive correspondence with Sonneborn, accompanied by several biographical essays written after Sonneborn’s death, and a large body of correspondence of the controversial reorganization of the biological sciences departments at the University of Illinois in the 1970s. The collection also includes a selection of Nanney’s writings and a handful of photographs. The protistologist Hope T. Ritter (1919-2007) is recognized for his important research on the evolution of mitosis. A native of Allentown, Pa., Ritter received his doctorate at Lehigh University in 1955 for a study of the gut fauna in a subterranean termite. Building on this research during the 1950s, he became the first scientist to successfully culture Barbulanympha, a hindgut flagellate symbiont of the wood-eating cockroach Cryptocercus, which has since become a model organism for study of the evolution of mitosis. After teaching at Harvard (1957-1961) and SUNY Buffalo, Ritter moved to the University of Georgia in 1966, where he remained until his retirement from teaching in 1987. The Ritter Papers contain valuable professional correspondence, lab notebooks, and a large number of electron micrographs documenting his research. A native of Minneapolis and graduate of the University of Minnesota, Craig Sandgren received his doctorate at the University of Washington (1978) for research conducted at the Friday Harbor Marine Biological Laboratories on the resting cysts of chrysophyte plankton. After a stint on faculty at the University of Texas Arlington, Sandgren landed at the University of Wisconsin Milwaukee, where he remained for twenty five years, emerging as a leader in the field of phytoplankton ecology. Although widely known for his work on reproductive patterns in chryosphytes and on the fine structure of their various life stages, his work extended to both marine and fresh water environments and included studies of algae and plankton, aquatic ecology, and intertidal life, among other topics. A popular teacher and avid field biologist, he maintained a strong connection to Friday Harbor throughout his career but maintained active projects in lakes across the northern Midwest as well. Sandgren passed away on Dec. 24, 2011, after a battle with pancreatic cancer. The Sandgren papers includes a small quantity of professional correspondence, grant proposals, offprints, and other miscellaneous materials relating to his career, along with hundreds of electron micrographs of chrysophytes, videotapes, and photographs. Distinguished researchers in the Department of Anatomy and Structural Biology at Albert Einstein College of Medicine, Birgit and Peter Satir have made fundamental contributions to the study of exocytosis and the ultrastructure of cellular motility. While working on his doctorate at the Rockefeller Institute, Peter spent 1958 studying at the Carlsberg Biological Institute in Copenhagen, where he met Birgit. After completing their degrees in 1961 and marrying the next year, the couple went on to academic appointments at the University of Chicago and Berkeley. Although they are considered the first couple to be allowed to work in the same department at Berkeley, Birgit was never fully salaried, prompting the Satirs to move to more favorable circumstances at Einstein in 1977. Birgit’s research has centered on the nature of microdomains in cell membranes and how cells secrete chemical products, while Peter has studied the role of the structure and function of cilia and flagellae in cell motility. The Satir collection contains professional correspondence, journals, and several thousand electron micrographs and motion picture films of ciliates and flagellates taken in the course of their research. Specializing in study of the biology and evolutionary history of ciliophorans, Eugene B. Small conducted both laboratory and field studies in comparative morphology and morphogenesis, ciliate ecology, phylogeny, life history, and nutrition. He was particularly noted for his work on ciliophorans from marine habitats ranging from the psammitic shores to the pelagic zones to deep sea hydrothermal vents. After receiving his doctorate at UCLA in 1964, Small served on the Zoology faculty at the University of Illinois and, from 1972, in the Department of Biology at the University of Maryland. The collection consists primarily of thousands of electron micrographs of ciliophorans taken over the course of Small’s career, along with a small number of laboratory and field notebooks. Noted for his research in photosynthesis and the redox activity associated with the plasma membrane of plant cells, the plant physiologist Arthur I. Stern served in the Botany and Biology Departments at UMass Amherst for over thirty years. Receiving his doctorate at Brandeis University for a dissertation under Jerome A. Schiff on chloroplast development in Euglena (1962), Stern spent three years as a post-doctoral fellow at the NIH before joining the Botany faculty at UMass. Teaching courses in plant metabolism, he continued his research on chloroplasts and photosynthesis in Euglena and Phaseolus, among other topics. In 1982, Stern helped develop the biology track for the Honors Program and new Commonwealth College. Stern transferred to the Biology Department in 1988 and retired in December 1997. The Stern Papers contain a range of materials documenting Stern’s research on photosynthesis, particularly in Euglena, notes for research and teaching, and a small assortment of professional correspondence. Also of note are some reminiscences contributed by Stern following Jerome Schiff’s death in 1995. Born in Cairo, Egypt, in 1939, F.J.R. “Max” Taylor became an internationally recogninzed specialist in phytoplankton. Educated primarily in his native South Africa, Taylor studied Zoology and Botany at the University of Cape Town, receiving his doctorate in 1965 for a dissertation on the phytoplankton communities in the southwestern Indian Ocean. Joining the faculty of the Departments of Earth and Ocean Sciences and Botany at the University British Columbia in 1964, he became full professor at the age of 35. At UBC, he continued to work on the phytoplankton of the Indian Ocean, preparing the seminal Indian Ocean Dinoflagellate Atlas (1976), which included some of the earliest electron micrographic illustrations of dinoflagellates. He was a pioneer in the study of the ecology of harmful algal blooms (red tides and brown tides), and he and Anand Prakash were the first to identify the causative dinoflagellate behind paralytic shellfish poisoning. His diverse research interests ran the gamut of ecological and evolutionary studies, from study of cryptomonad endosymbionts in Mesodinium to the feeding mechanism in Protoperidinium and the motility of the dinoflagellate transverse flagellum. An important figure in paleopalynology, he was also an early contributor to Serial Endosymbiosis Theory for chloroplasts and mitochondria. Named a fellow of the Royal Society of Canada in 1997 and recipient of the Yasumoto Lifetime Achievement Award by 9th Int Conf Harmful Algal Blooms (2000), Taylor was a cofounder of the International Society for Evolutionary Protistology (1975) and Founding President of International Society for the Study of Harmful Alagae (1998). He retired in 2005. Consisting primarily of research notes, drafts of publications, and illustrations, the Taylor Papers offer primary documentation of the ecology and evolutionary biology of dinoflagellates.